“Me too,” my friend said. We plan to check the society pages of the Sunday Denver Post. (If you’re reading this, newlyweds, congratulations!) That’s how Lekman came to town, and he chose to spend his Thursday night on a secret show. Through a series of events that started on Twitter, we found ourselves in a living room down in the Baker District with about two and a half hours’ notice. It came from an email with not much more than an address and a start time. The house is shared by at least two young men who are musicians themselves; they opened for Lekman. The fifty-odd people who showed were mostly out in the back yard socializing, but my friend and I wandered in to watch. I’m guessing it was the dining room that was converted into a performance space, with blankets and sheets stapled all over the walls and ceiling, and the fabric covered in places by paintings. They’d set up a light system, too, and a permanent taper stand was up in the corner by the ceiling. 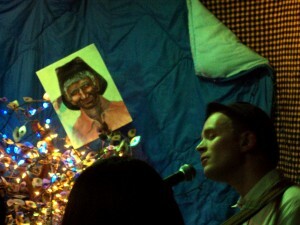 There were strings of lights hanging in front of the (covered) bay window, where the performers are supposed to stand, and strands of lights hanging all over the fake potted tree behind the mic stands. So, yeah. 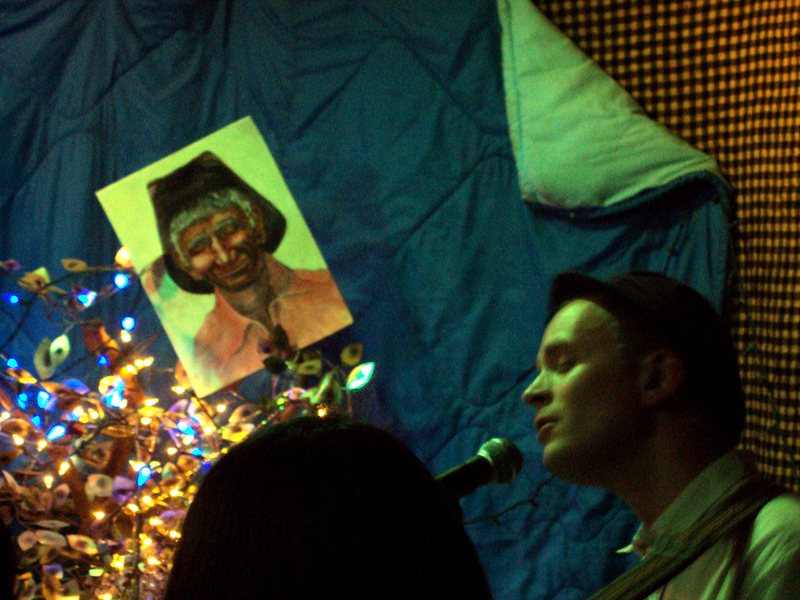 We saw Jens Lekman play in somebody’s dining room. The reason I knew this was something that we absolutely shouldn’t miss, despite both of us having work early in the morning, was an endorsement from one of my best friends from high school, who was the one who introduced me to the Magnetic Fields when there was boy trouble in college. She compared Lekman to Stephin Merritt. I didn’t follow through on her recommendation, but I remembered the name, I sampled some songs yesterday, and I thought, This is going to be really, really good. And it was. Of the fiftyish people, we managed to squeeze about twenty-five into the dining room. Lekman was quiet and unassuming, periodically accompanied by violin and cajón. His voice was quiet — “Denver’s air is so dry,” he said, “I have to be careful” — and the audience respected that. As for the music, it was wonderful. I didn’t keep track of what he played, so unfortunately I can’t provide a set list — three of the songs he played last night were “Waiting for Kirsten”, “The Opposite of Hallelujah”, and “The End Of The World Is Bigger Than Love” — but I know I’ll be listening to Jens Lekman’s music a lot more starting right now. Apparently Lekman was supposed to play in Denver in 2008 but couldn’t make it because of getting stuck in a snowstorm in Wyoming — that’ll do it — and he said he was glad to finally make it. He also spoke about his fondness for doing living room and back yard shows — nobody at the door treating you badly, no bartender treating you badly, no sound guy treating him badly — and his gratitude that he was able to play for us like that. It was hot, it was crowded, it smelled like beer and cigarettes and a little pot. The lights sometimes changed colors in alarming ways. The dining room was like a sardine can. In other words, it was magical and I wouldn’t change a minute of it. Thanks to the soon-to-be newlyweds who brought him to Denver; thanks to the guys who offered up their house to a bunch of strangers; thanks to Jens Lekman and company for a great show. Telluride may be ongoing, Mumford and Sons may have been at the Fillmore for the last two nights, but I’m convinced I caught the best show of the week.